When I last (and first) encountered Rez Abbasi was on Behind the Vibration last year. That release featured the guitarist as leader of a group called Junction. He’s also recorded with a group he called Invocation, featuring Rudresh Mahanthappa (alto sax), Vijay Iyer (piano), Johannes Wiedenmueller (bass) and Dan Weiss (drums), producing Suno Suno in 2011. 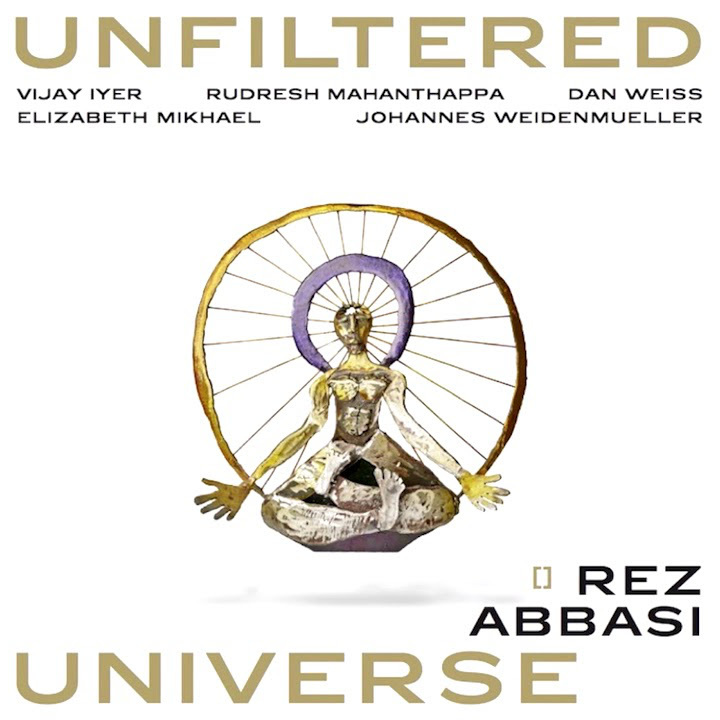 I haven’t heard that album, but Unfiltered Universe features exactly the same lineup (with the addition of Elizabeth Mikhael on cello), though it’s not labeled Invocation here. This is a more acoustic outing than Behind the Vibration, with Abbasi’s guitar being the only electric instrument. Whatever he chooses to call it, this is an outstanding collection of musicians, and they’ve recorded an amazing example of how creative jazz can still be at this point in its history. Iyer is stunning on the piano, inventive throughout, whether taking the lead or providing support for the others. He is surely one of the best pianists of his generation. Mahanthappa is also stellar, with a beautiful tone and creative playing informed by both American and Indian traditions. It is to Abbasi’s credit that he fits right in with these two giants. His guitar work at times provides counter-leads to the sax, at times provides textures and backgrounds, and shines on the solos. His use of dissonance and edgy note choices is masterful, and his tone is a wonderful balance between natural and distorted. Wiedenmueller and Weiss don’t often step into the spotlight, but they provide the perfect touches of mood and propulsion needed for each tune. Mikhael’s cello is very nice in the places where it appears, including some lovely interplay with Wiedenmueller. The compositions are all winners, with excellent use of the voices available. Every time I listen to this album, I find more “wow” moments. Anyone who likes jazz owes it to themselves to give this a listen, unless they’re too hopelessly mired in adoration of the mythical names to try anything new.